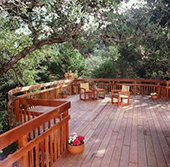 Wood decking has a natural beauty and an elegance that cannot be duplicated. From crisp yet rich tonal properties to intricate whorls representing its time and place, wood can create inspiring outdoor sanctuaries, embolden traditional architecture or bring warmth to the most modern design. Softwood lumber is very affordable compared to other options on the market, such as PVC or composite decking. It's also a good investment: homeowners who add a wood deck to their outdoor space can recoup nearly 81 percent of the cost of the project when they sell their home. Wood decking is a cost-effective way to greatly enhance the beauty and functionality of your outdoor living space. Softwood lumber is used in deck substructures because of its easy workability, affordability and strength. Pressure-treated lumber is a go-to choice for your deck's substructure (the posts, beams and joists that hold up the deck) and what contractors overwhelmingly use. Posts are attached to the deck frame to provide the support for the railing system. Wood deck railing systems tend to be the most commonly used type of railing because of their relatively low cost and design flexibility. 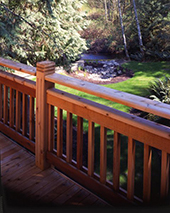 Custom wood deck railings are available in different styles and options to suit any deck configuration or design preferences. Dimensional lumber is cut to standardized width and depth, specified in inches. Builders and contractors extensively use dimensional lumber in framing homes and as structure for decks and other outdoor projects due to its affordability and load-bearing strength. As they say, good fences make good neighbors. 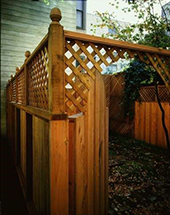 Wood fencing provides an attractive frame for any backyard or home with a touch of natural beauty. Fencing looks can be customized for any architectural style and with designs that range from simple to ornate. The fence post is a wooden post set in the ground as a supporting part of a fence. 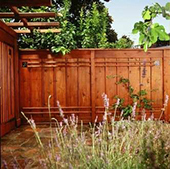 Wood is a go-to choice for constructing fences due to its strength and affordability. Wood is also a long-lasting material, ensuring that your fence will be in top shape for years to come. Wood siding instantly adds warmth and beauty to a home, and the rich look of wood complements any architectural style. Wood siding is also a good choice for the environment, since most wood siding products are harvested from sustainably managed forests. And wood makes for the perfect trim for windows, doors and entryways, complementing any architectural style. Timbers are softwood lumber beams or posts that are used for building in areas that require sturdy construction and structural support. Timbers have a rustic look and can add a touch of natural beauty to any home. Further, wood used in a home's structure produces a stress-reducing response, keeping you and your family healthier. Complement any project or design with an array of high-quality wood options. Wood windows offer unparalleled beauty, warmth and design flexibility — with exceptional energy efficiency. Wood on the ceiling can add architectural interest to any room, attracting the eye upward to explore the space. Using wood trim, plank, decking or even siding on the ceiling wall will raise the decorative elements in the room to a new level. Visitors will be sure to stop and pause when they first notice the attractive style of the "fifth wall." 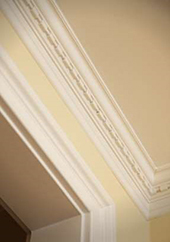 Crown molding is an ornamental trim around the walls of a room just below the ceiling. Whether entry, French or interior, wood doors combine beauty, durable elegance and substantial performance characteristics. Wood doors offer many design options and can be custom crafted in virtually any shape or size and incorporate whatever molding profiles, panel configurations, glazing options or carvings that you please. With distinctive grain patterns and warm natural tones, the beauty of a wood floor is prized by designers, builders and homeowners alike. Whether newly installed or preserved for generations, wood floors add a natural warmth, comfortable texture and sense of solidity. Plus, with proper care and easy maintenance, durable wood floors can last a lifetime. 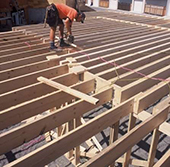 Joists are horizontal supporting members that fall between the foundations, walls or beams to support ceilings or the floor, and are often laid in repetitive patterns. A wall stud is a fundamental element in building framing. Studs form walls, carrying vertical structural loads or non–load bearing such as partition walls, which serve to separate a space. Studs help give shape to a building, holding in place windows, doors, interior finishes, exterior siding, insulation and utilities. Roof trusses are structural building components used in residential roof construction. Typically, trusses make triangular shapes and are connected with metal plates. Wood is a practical material for roofing due its strength in structural applications. 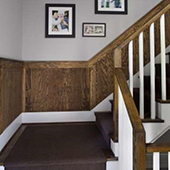 Wainscoting is wood paneling that lines the lower part of the walls in a room. Wainscoting isn't just for walls and ceilings, though. You can use these features around doors, to set off windows, or even frame fireplaces to create focal points that become the heart of the room. Adding this touch of wood to a room brings warmth and natural beauty, transforming any interior. 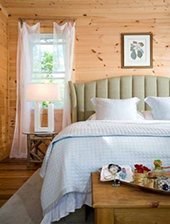 Wood paneling brings warmth and beauty to your walls. It's also a way to incorporate nature into your living space. Research has shown that designing with natural elements like wood can lower stress levels, creating a healthier home. Walls enhanced with real wood can create texture and dimension, separate one part of a room from another, or simply add warmth and character to any living space.